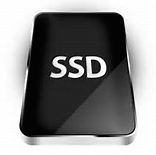 SSD Hybrid Drives For Mac - SSHD The Future Of Storage? Seagate was first to enter the Solid-State Hybrid SSD Drive market with their Momentus XT series. Initially in 250, 320, 500GB capacities. 2nd generation FireCuda drives now up the capacity to 2TB with improved controllers and firmware. They incorporate up to 128GB SSD flash memory combined with high-speed 7200RPM spinning platters to deliver the Best-Of-Both-Worlds storage performance. Offering some tradeoffs in speed of a full-blown SSD, they make up for it in VERY AFFORDABLE extra capacity. Typical SSD's cost $0.20 per Gigabyte, whereas a Hybrid SSD for your Apple computer costs a fourth of that. It's a fair tradeoff: Afforability and higher capacity for slightly lesser performance than a completely flash-based typical SSD drive. Hybrid drives offer better peformance than ANY traditional spinning platter drive made! A Hybrid SSD for your Mac may a great alternate option, and doing the drive swap in many older SATA drive Mac models like MacBooks, or iMac and Mac mini desktop is fairly easy to perform. The 2nd Generation of the Momentus XT SSD Hybrid Drive is a 750GB SATA III drive. It's the best option for Mac drive upgrades featuring significantly improved architecture, firmware and performance in the highest capacity yet. Buffalo offers a unique desktop external Hybrid backup drive that combines DDR memory modules with a conventional hard drive for SSD-like performance. LaCie's offers a D2 hard drive that features USB 3.0 and ThunderBolt 2 - but offers an _optional_ 128GB SSD module backplane upgrade that removes the USB 3.0 port, but provides vastly better performance with it's ThunderBolt 2 PCIe SSD module. The Mac mini and MacBook can ideal candidate for a Hybrid SSHD drive. As the low-end of Apple's desktop line, in some ways a mini can benefit the most from the speed boost a Hybrid drive will give. Apple tends to use rather slow 5400RPM drives in it's low end models. So the stock drive performance is less than impressive. Even if you didn't opt for a full SSD or Hybrid drive, if you ever have to replace your hard disk - go for a 7200+RPM mechansim with large cache. The performance boost will be significantly better than the stock drive. Unfortunately, Mac mini dissassembly may be a bit daunting for those inexperienced with drive swaps. For some, paying a qualified Mac computer tech who can perform the swap is wise - and they can also assist with cloning your Mac mini's conventional drive to transfer the data. For the more courageous DIY types, plenty of online How-To Mac mini take-apart videos can help you navigate the finer points of a drive upgrade. 3.5" Hybrid Drives for iMac or Macintosh Pro? Eventually we'll see full-size SSD Hybrid drives for Mac systems like Macintosh Pro towers and iMacs. Initially, drive manufacturers were focused on the smaller 2.5" Hybrid SSD for MacBook Pro or Mac mini type systems. With over two thirds of all computers - both in the Windows PC and Macintosh market now portable laptop systems - there's simply far more demand for smaller drives. As such, these initial Hybrid storage solutions are targeting the highest volume disk storage market first. Other Hybrid solid-state drive size options are in the future. Note - Apple and the Apple logo, iPod, iPhone, iPad, Mac, MacBook Pro and Air, iMac or Mac mini, OSX and and any others are a registered trademark of Apple Inc. in the USA and other countries. Any other computing accessory, peripheral, add-on, upgrade or gizmo and gadget manufacturers, products and brand names that may be referenced at this web page are officially registered trademarks of their related corporation. Looking for the best of both worlds? A Mac compatible hybrid SSHD drive can give you solid-state memory speed advantages - while providing a higher-capacity and low cost drive upgrade with some of the benefits of an SSD in your MacBook Pro, iMac, Macintosh Pro or Mac mini computer. Combining a small amount of flash memory onboard with a high-RPM conventional spinning platter hard drive mechanism - these Combo hybrid SSHD disk drives balance low-cost and high storage capacities with much higher performance. Hybrid SSD+HD's are Platform-Neutral. These 2.5" laptop size SATA drives can be used with Windows, Linux or Mac OSX without needing any special drivers. They just need to be formatted and partitioned properly for your given operating system. Your Apple computer simply sees a SSHD as a conventional hard drive. Intelligent caching of frequent or recently accessed data is handled in the SSDHD drives firmware using sophisticated algorithms to make the most of the small SSD onboard and maximize Read performance and speed up Write performance when it can. The speed benefits are most obvious in typical computer use, launching and switching between your Mac applications. Sadly, backups don't fare quite as well performance-wise. But that's normal: The constant stream of unique data to a Mac backup drive doesn't really give the SSD Hybrid any chance to cache or RE-access the data. That's all just a normal part of the way data storage drives operate in the real-world of SSHD hybrids.